Posted in Uncategorized and tagged Behind The Scenes, Blue theme, Cocktail Party, Comic Book Theme, Event Planning, Green theme, KMKCreatives, Mood Board, Spring, Superhero Theme, Superheros. Bookmark the permalink. I have a confession to make. While I usually am pretty picky about the food and beverage items that I buy, I can sometimes be a sucker for creative packaging. With that being said, one of the original reasons why I bought a Mexican Coca-Cola was because of the packaging. There’s something about drinking a coke out of a slim glass bottle rather then an aluminum can that just feels right. 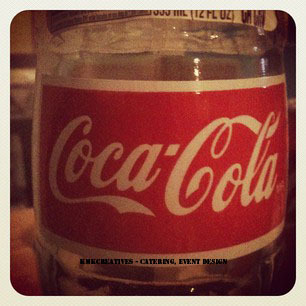 If you haven’t tried a Mexican Coke yet, I suggest you put it at the top of your to do list. So, what’s the difference between the two? Besides the packaging, American Coca-Cola is made with high-fructose corn syrup while the other is made with sugar. 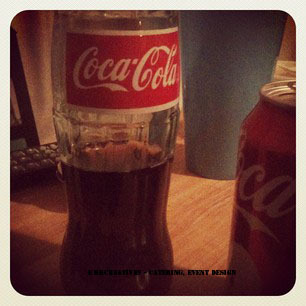 Because of this, the Mexican Coke produces a smoother, less acidic, and superior taste. It’s one of our favorite things! 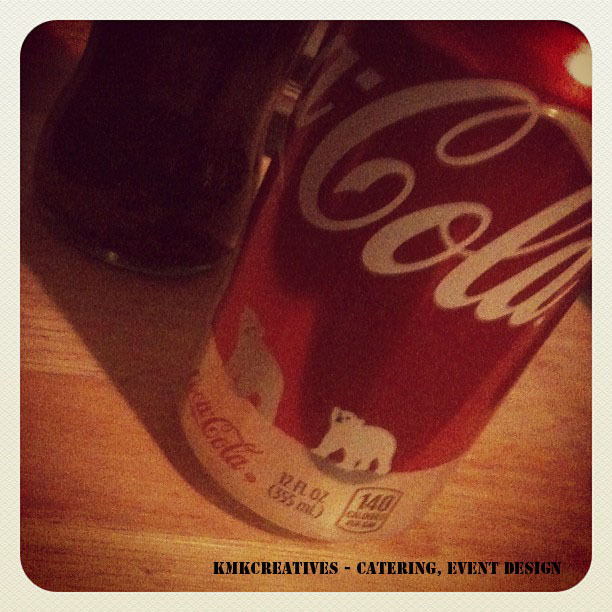 Posted in Uncategorized and tagged Beverages, Coca-Cola, favorite things, KMKCreatives, Mexican Coca-Cola, Soda. Bookmark the permalink. What would the Superbowl be without wings? Or some bleu cheese to slather them in for that matter? Dress up your wings with a bleu cheese and cracked pepper cole slaw for a delicious twist on this sports classic and instead of reaching for the typical buffalo sauce, try this Mango Habanero Sauce. It’s sweet but spicy – you can’t go wrong! 2 Ripe Mangos – Peeled pitted and rough chopped. 1/2 of 1 Habanero Pepper – Seeded and finely minced. Puree the Mangos, wine, and orange juice until smooth. Strain through a fine mesh strainer. Mix in the Habanero. refrigerate if not using immediately. Posted in Uncategorized and tagged bleu cheese, Habanero, KMKCreatives, Mango, Sauce, Superbowl Recipes, wings. cole slaw. Bookmark the permalink. I know what you’re thinking. “It’s just ham and cheese on a small bun, right?” Wrong. It goes without saying that ham and melted cheese are a delicious combination to begin with, but this particular version has a secret ingredient; A poppy-seed sauce that can turn any second-string slider into an all-star. With the Superbowl in the near future, they are a perfect addition to your snacking line-up. What makes them even better is the fact that you can assemble them the night before to ensure that you spend less time in the kitchen and more time cheering on your favorite team. In a small bowl mix the mayo and the miracle whip together. In a separate bowl whisk together all of the sauce ingredients. Spread Mayo mixture evenly on the center of each slider buns. Place a piece of ham and cheese on each, close bun, and place each sandwich in a large baking dish. and bake for 10-13 minutes or until the cheese is melted. Uncover and bake for 2 minutes or until the tops of the sandwiches are slightly browned. Enjoy right away! Posted in Uncategorized and tagged food, ham, KMKCreatives, poppy seed sauce, recipe, sliders, snacks, superbowl party, superbowl series, swiss cheese. Bookmark the permalink. When one of our favorite clients approached us about planning a Harry Potter themed birthday bash for her twelve year old son, we have to admit that the child in all of us got a little (okay, very) excited. Here we will show you some of the steps we have taken in the initial planning phase of this particular party. The first thing we do when planning a complex or larger event is to create a mood board. What is a mood board? Good question. A mood board is just like it sounds. It’s a board that we post anything on that we think sets the mood of our event. (see our Harry Potter Board above). This may include images, color swatches, icons, etc. The list is endless. Basically, it is organized chaos of anything that we may find that we can put on to the board to inspire creativity. These visuals also help our staff to get on the same page with the type and tone of the event. It’s Point A, if you will. Originally when we founded our company we did mood boards the old fashioned way (Cut and paste! ARGH!) but with the addition of moodshare software (finally!) we have been able to create digital boards that our entire event team can share and modify anywhere wifi allows, which is great when we are on the go. Not only are we happy to not be knee-deep in scissors and elmers glue anymore, but being able to add media files to our boards as well has offered up a whole other depth of inspiration. After we finish our board we start pulling more concrete ideas from it. One of the first is a color scheme. (See our scheme above) The Color scheme we have chosen for this particular event comes from the colors that make up the four houses of Hogwarts, the wizarding school in HP. After we select the colors, we make a chart of the exact percentages and colors that we have chosen. This ensures that no matter what type of project, whether it be one of our chefs constructing a dessert table or one of our designers creating invitations, we all have the same colors to pull from. Posted in Uncategorized and tagged Birthday Party, Color Scheme, Event Planning, Harry Potter, KMKCreatives, Mood Board. Bookmark the permalink. Cupcakes are one of the greatest little joys in life. 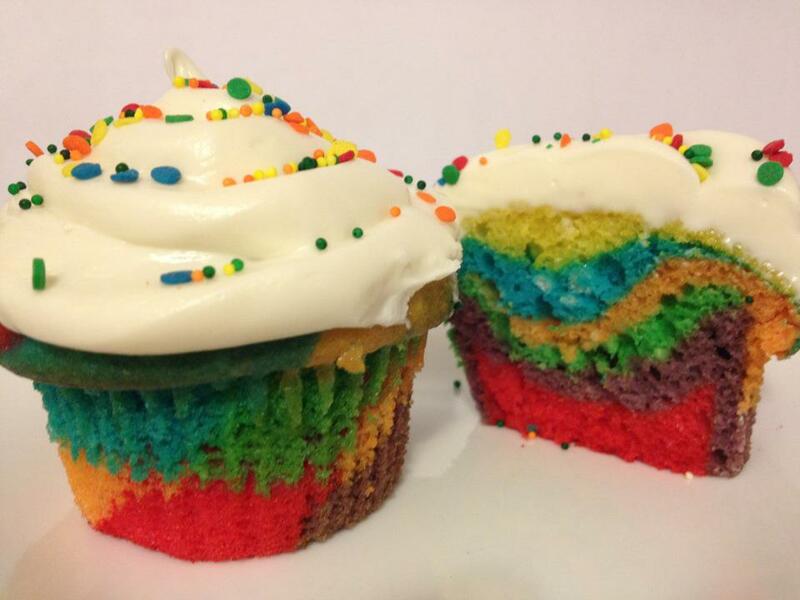 This week we’ve whipped up some cupcakes that are not only delicious, but they look cool too!! Preheat oven to 350 Degrees and line a cupcake pan with 12 liners. In a bowl beat together the butter and sugar until creamed. Add the eggs, beat well after each. Add Vanilla extract. In a seperate bowl whisk together the flour, baking powder, and salt. Slowly and alternatly add the flour mixture and milk. Scrape down the sides of the bowl as needed. When you have your batter, seperate the batter into four or five smaller bowls and add a different food color to each. 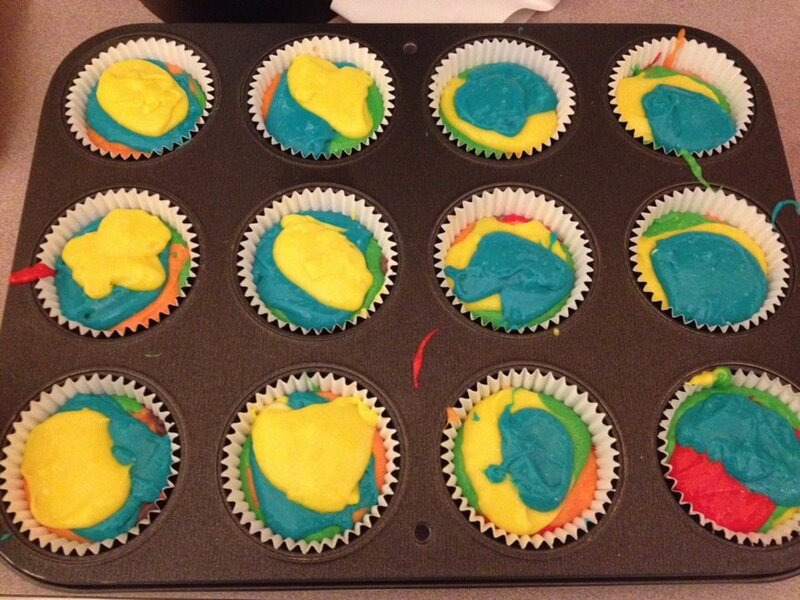 Pour a little of each color battered into the cupcake liners. Bake for 17-20 minutes or until done. These cupcakes are great for kids parties or if your event scheme incorporates a multitude of different colors. Also, for those who are culinary challenged, boxed cake would also work here. Posted in Uncategorized and tagged cupcakes, dessert, DIY, event design, food, fun for kids, KMKCreatives, Rainbow colors. Bookmark the permalink. It’s the little things that really add to the atmosphere of an event and one of our favorite things are candles and mood lighting. We are on an endless search to come up with new concepts, lighting crafts, designs, patterns, and placements. Recently at one of our electro themed events we thought it would be fun to use something with a neon glow instead of ordinary candles so we used glow stick light jars to add a creative twist. It’s a really neat candle alternative and it has endless design possibilities. Here’s how to create the simplest form of glow stick light jars. The tube in the middle of the glow stick that you break is made of fiberglass. This is not something to mess with. When you cut open the glow stick be extremely careful and wear gloves. There are two chemicals, the chemicals contained within the fiberglass tube and the chemicals outside of the fiberglass tube are what mix together to create the glow. While these chemicals are non-toxic and non-flammable you will still want to make sure that they don’t get on your furniture or skin. They will stain! To create these bad boys all you need are glow sticks (There are a host of different places where you can buy them in bulk or you can even find them at the dollar store), Jars, kitchen gloves, scissors, and something absorbent like paper towels or toilet paper. Second, put the absorbent paper into the jar. If you wish to create layers with different colors, then only don’t fill the jars all the way. 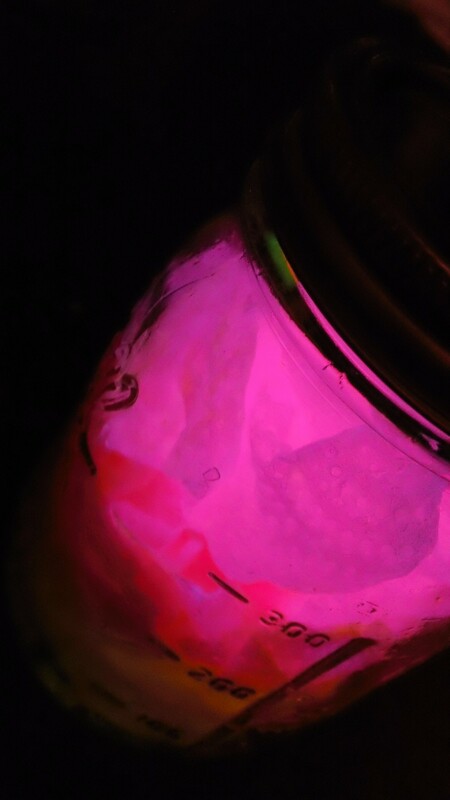 Third, With your gloves on, cut open one end of the glow stick and poor the glowing contents into the jar. Repeat as many times as you wish. It’s that simple! Note: There are a lot of people who have said mixing water in the jar helps to keep the glow. Simply put, it won’t. For other design ideas you can draw different patterns on the paper in black ink before putting it in the jar or find other little trinkets that correspond to your event to put in the jar. The possibilities are endless. 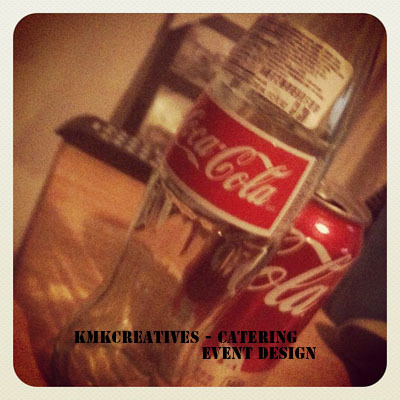 Posted in Uncategorized and tagged candles, crafts, DIY, event design ideas, glowsticks, jars, KMKCreatives, lighting. Bookmark the permalink. Enter your email address to follow this blog and receive notifications of new posts, recipes, tips, crafts and much more from the staff at KMKCreatives.